Watching a clownfish seemingly playing in its anemone host is one of the most magical things that can happen in our aquariums. There’s just something about the symbiosis of it. In nature, a clownfish cannot survive without a host anemone. They would simply be picked off by a predator as they would have no place to hide. In the relative safety of our small glass boxes, however, clownfish will be perfectly happy without a host anemone. Although many people still want to experience that little piece of nature for themselves. So how do you get your clownfish to live with a host anemone? While there’s no guarantee that they ever will, there are a few tricks I can share that can help. What type of anemone should I get for my clownfish? This is a very common question, and a good one. Because in many cases the type of anemone can make a big difference. Since this website is about Ocellaris Clownfish, we’ll mainly focus on them, as well as Perculas, since they have very similar requirements. In the wild, A. ocellaris and A. percula host only Heteractis magnifica, the Magnificent Sea Anemone, Stichodactyla gigantea, the Giant Carpet Anemone, Heractis crispa, Sebae Anemone and Stichodactyla mertensii, Merten’s Carpet Anemone. Unfortunately, these are generally not great choices for the average enthusiast. They either get quite large or are somewhat delicate in their requirements (or both). But fear not! There is another anemone that is fairly common in captive reefs, which will host both Percula and Ocellaris clowns. Entacmaea quadricolor, or the Bubble Tip Anemone, is relatively easy to care for and serves as a very good surrogate for hosting Ocellaris and Perculas. The Bubble Tip is often called the Rose Bubble Tip or Bulb Tentacle Anemone. They actually come in quite a few colors, ranging from varieties with lots of yellow to green to dark red and purple. Exotically colored species can be very expensive, but they are incredibly beautiful. Meanwhile the more common Rose Bubble Tips are still very nice, and while not cheap, the price is reasonable. Especially considering the fact that they will often split in the aquarium, giving you more and more anemones, which you can keep, trade or sell. While the purpose of this article is not anemone care, I will give a little advice on how to keep your anemone happy. Because if your anemone is unhappy or dies, it can create a real mess for your tank and a headache for you! So first things first. To successfully keep a Bubble Tip, you should have a good grasp on basic marine tank husbandry. I won’t get in to all the details, but you should have solid water movement, strong filtration and overall a stable system. Large fluctuations in parameters such as PH and salinity will lead to issues with your new friend the ‘nem. Second, strong lighting is a must. While a Bubble Tip will probably survive for some time with standard florescent or even stronger compact florescent lighting, it will never thrive and eventually will probably die a slow death. A reef-rated T5 lighting system will do nicely for Bubble Tips, as will metal halide lights or quality reef LED systems. Aside from, “Is my light strong enough for an anemone?” – the next most common question is, “Do I need to feed (or what do I feed) my anemone?” The answer will vary somewhat, but basically, yes. Anemones need to eat. So the real question is do your regular feedings provide enough food for your ‘nem? When an anemone is being hosted, additional feedings are generally not necessary (but it’s fine if you want to). Many people rarely or never supplement their anemone’s meals and have no problems whatsoever. However, it never hurts to feed it. If it doesn’t want to eat it will just refuse the food. a food source for your ‘nem. These requirements line up nicely with clownfish as you might imagine. The biggest difference being that clownfish alone don’t really need special lighting. 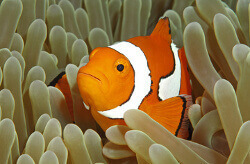 This article has more detailed information about clownfish care. Help, I put an anemone with my clownfish but it won’t host! Alright, the point of the article. You’ve bought an anemone, it’s happy and your clownfish is happy, but they aren’t happy together. In fact, your fish won’t even swim by the ‘nem and you don’t understand why he won’t go to his new home! For some fish it just takes time. I’ve had clowns that have nearly immediately gone into a new anemone. Sometimes it just takes a few days. Then I’ve had others that took a few months before they suddenly discovered their new best friend. And others still will never host for one reason or another (or they’ll host a coral, power head, corner of the tank, whatever except the anemone). Some people will actually tell you that if you put pictures or videos of other clownfish hosting in an anemone, that your fish will follow suit. I must admit I have no idea if this works – I’ve never tried it. Although I’ve heard mixed reviews. That’s an option. Personally, what I think is the most sure-fire way to get your clown to host is to make sure that it finds the anemone. Once it does, it will likely never want to leave. This short video is of a young Onyx Picasso clownfish which was hosting a BTA after only 3 days together. It’s not the best video but I thought it was good to share since this was literally within the first hour that it “discovered” the ‘nem. Before you read the tip I want to warn you. Do this at your own risk. It does work but it can also be very stressful on the fish and in some cases, especially with carpet anemones, the clownfish can actually be killed. If your fish shows signs of stress you should separate them immediately. So just for emphasis – this works, but use caution – watch your fish closely! Place your anemone and your clownfish together in a very confined space for a short period of time. This works best if you have a ‘nem that is on a small rock or something else you can remove from the tank. Place the rock with the anemone into a small bowl, being sure to cover it entirely with water. Try not to upset it too much during this or it will shrink down and be impossible to host. It might take some patience, but eventually it will open back up as long as it’s happy. Now put your clownfish in the bowl. Within a short period of time, it should find the anemone and start rubbing against it. Then, eventually it will dive right in and they will be virtually inseparable from that point on! If the fish is still reluctant, you can try a smaller bowl, or start removing water until it has very little room to swim except in and around the anemone. Be patient! You don’t want to just drop the fish on top of the anemone, you want him to “discover” it. But again, I would use this as a last resort. In most cases, the fish will eventually find the anemone and once they do, you’ll have a glimpse at one of the most beautiful relationships in the world’s oceans.